USDA, ARS, Genetic Improvement of Fruit Crops using advanced Genomics and Breeding Technologies. 1994 B.S. Biology. Salisbury University, Salisbury, MD 21801. Lead Scientist. USDA-ARS, Appalachian Fruit Research Station. Kearneysville, WV 25430. The Genetic Improvement of Fruit Crops unit provides genetic solutions to major problems affecting temperate tree fruit agriculture including orchard productivity, high labor costs, bloom-time related cold injury, consumer demand for superior fruit quality, as well as the need for new genetic engineering technologies to address emerging threats. Plant Molecular Biologist/Pathologist. USDA-ARS, Appalachian Fruit Research Station. Kearneysville, WV 25430. POSTDOCTORAL FELLOW. University of California, Davis, CA 95616. Advisor: Dr. Pamela Ronald. Investigated mechanisms of plant immunity to bacterial blight disease (caused by Xanthomonas oryzae) in rice. Solutions to our long term food security will require a deeper understanding of fruit tree biology. Our newer peach varieties such as ‘Sweet-N-UP’, ‘Crimson Rocket’ and ‘SummerFest’ combine fruit quality with a more upright tree structure that allows higher fruit yields in the same amount of orchard space. 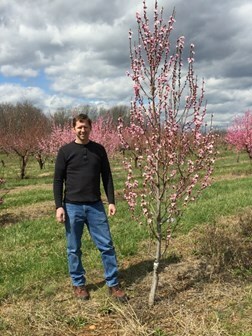 These novel “pillar” or “upright” shaped trees are being evaluated by growers for their ability to increase yields and reduce labor costs associated with tree management (top). In general, improving tree shapes so that they can be planted closer together and/or can be adapted to mechanization, would increase productivity and be more environmentally friendly. We have identified several genes that control branch growth and tree size (bottom). The knowledge gained from this work is providing us with new tools for improving agricultural productivity and sustainability, not only trees but potentially a wide variety of different crops. Drought and lack of water availability is a constant threat to fruit trees and other crops that require large volumes of water. One of the ways that plants adapt to dry conditions in nature is to develop deep root systems that can access water and nutrients trapped in deeper soil layers. We have recently identified a gene (called Deeper Rooting 1) that controls root growth angle in trees. We are now testing whether we can manipulate or breed for trees with enhanced DRO1 activity and thus deeper roots. The sugar content of fruit is measured using a device called a refractometer that reports sugar levels as brix (sugar content in an aqueous solution). The best peaches and nectarines have brix levels in the range of 14-18o. Our newest selections have brix levels >25o when ripe. This super sweet trait (that originated in South Korea) is currently being combined with bacterial spot resistance, upright tree shape, and later bloom time to produce the next generation of incredibly flavorful fruit.